For many of us, cracking open an egg in the morning isn’t anything special, or anything we would rave to our friends about. But for 64-year-old Maria Glória de Souza, who is from Brazil, an egg she collected from one of her chickens was certainly a sight to behold. Maria has been raising chickens for over 20 years, and had never seen anything like it! The egg was much larger than all the others, perhaps about triple the size of a normal one. She thought there could be something special inside, but had no idea what. Weighing in at just over six ounces, the contents of the egg were certainly a mystery. While others might have kept the egg intact, Maria decided it was worthwhile to reveal the hidden treasure inside. In a bowl, she cracked it open, and to her great surprise, there was another inside! 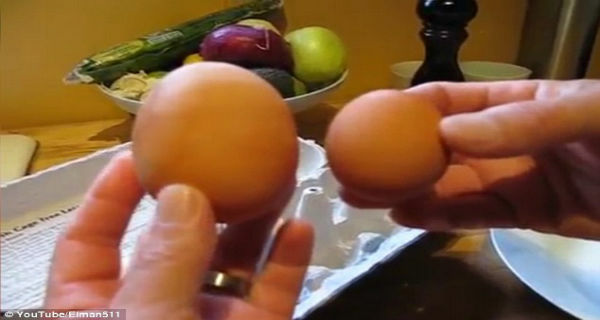 It’s hard to believe and quite rare, but there have been several documented cases of a hen laying an egg inside an egg. The complex phenomenon happens during its formation. Have you ever seen a jumbo egg like this in person? What is the strangest food phenomenon you’ve come across? Let us know in the comments!